Observing the world around you for gaining insight and making analogies; recognizing patterns for extrapolating information and predicting rules; and solving problems by representing what you know in multiple ways: all themes illustrated within recent CTL blogs. As I read through the BLOG entries, I couldn’t help but to be reminded of how those themes are critical skills for thinking mathematically and solving problems. In my work with mathematics teachers, I am constantly in search of materials and experiences that will support them in moving students forward in developing those critical process skills. Recently, I was sent a National Council of Teacher of Mathematics Illuminations (NCTM Illuminations illuminations@nctm.org) link with a unit on Paper Pool that provided opportunities for just that support. The Paper Pool unit is an investigative, interactive series of mathematics lessons that sequentially engage students in making observations by connecting to the sport of pool. 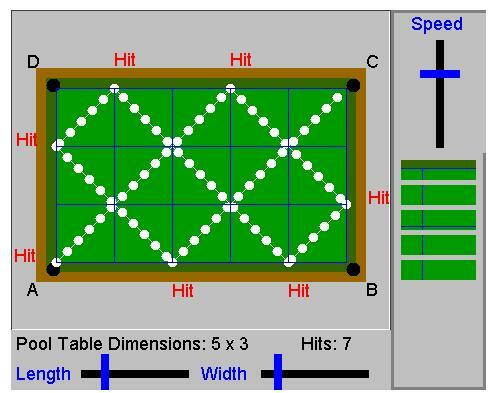 As a way of introduction, there is an interactive applet for exploring patterns when the dimensions of the pool table change and discovering the rule for the number of hits and the pocket in which the ball will land. As students interact with the applet, they gather and organize data and make predictions. Within the Paper Pool Unit there are five lessons and within each lesson there are necessary materials with ample illustrations of multiple ways by which students can represent what they know through tables, graphs, algebraic equations, words, and modeling with pictures (an addition from an earlier BLOG on multiple representations). The mathematics content developed through the Paper Pool Unit is: ratio, proportion, equivalent fractions, greatest common factor, least common multiple, and similar figures. Additionally, students use the process of mathematical thinking through gathering and organizing data, exploring patterns and formulating rules. As you and your students begin to interact with these Paper Pool lessons, please post evidence of student mathematical thinking through comments made, student work, pictures of students engaged with the materials, etc. For me, playing pool will never by the same. 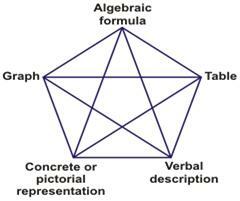 This entry was posted in Blog and tagged algebra, mathematics. Bookmark the permalink.